I’m reading a great book at the moment called Love Does by Bob Goff. It’s a religious book in a non-religiousy kind of way that my friend lent me with rave reviews. And one chapter really resonated with me. Bob talks about how he got into law school after failing his LSATS, and being declined entry to every school he applied for. He knew the dean had the power to admit him regardless of his test results, and so he sat outside his office every day for almost 2 weeks. And every time the dean walked past, Bob would say ‘Just tell me to go buy my books’. Until the poor guy was so worn down he gave in and admitted him. It’s pretty funny really. I admit I chuckled. Here is a guy who didn’t even scrape through the LSATS but through sheer determination got himself into law school. He went on to graduate and practice law for 25 years too! And then I found myself admiring this Bob dude. He knew what he wanted in life and even though the world told him he wasn’t qualified he didn’t just give up. He kicked down the door that was standing in his way and he took what he wanted! And this is what I want to encourage you to do. Push yourself. Say yes to the things you’re afraid of. Kick down some doors and make your goals happen. Don’t just wait passively for them to come to you, because 9 times out of 10 they won’t. And if chasing your dreams means trying and failing a hundred times before you get where you want to be, then that’s ok. In fact it’s more than ok. It’s fantastic! Because whether we succeed or not, failure is essential for our growth. 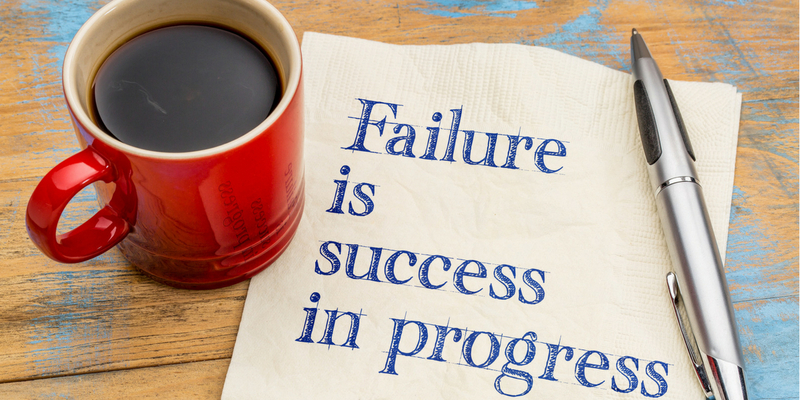 Failure helps us learn valuable lessons, stretches the parameters of what we believe we can do, and builds resilience, by always pushing us past our ‘safe’ boundaries. Try new things. Say yes when your whole being is screaming ‘no way!’ Figure out what you want in life and then make it happen! We were not meant to simply coast through life. We were meant to LIVE it! But I wish I had followed my dreams and chased a career in writing. I don’t know how my life would have turned out if I had pursued this straight out of school, but I do know this. Putting my books, and thoughts, and life out into the world for other people to read and comment on, has been one of the most terrifying things I’ve ever done. But it has also been one of the most rewarding. I have stretched my abilities and grown more in the last 3 years than I would ever have thought possible. My writing has given me confidence and self-worth and even though I almost threw up out of nerves when I appeared live on morning TV, it remains one of the things I’m proudest of. Not because I was on television, but because I was terrified and I still did it. And I want to encourage you to do the same. Don’t let being scared of failure, of what other people may think, or any other damn excuse hold you back from chasing down what you want. You only have one life. Make sure you live the best version of it you can. Sometimes your vision of what you want and where you want to be will change before you get there, but the fact that you are constantly pushing yourself, testing your limits, and growing as a person, will ensure that no matter where you end up, or how many fails you have along the way, your life will be the richer for trying. Now go kick down some doors!